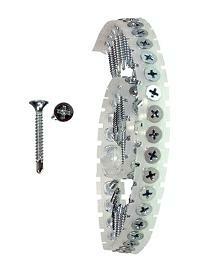 PRODUCT: #6-8 x 1-5/8 INCH SELF-DRILLLING COLLATED DRYWALL SCREWS, BUGLE HEAD, ZINC PLATED, #2 PHILLIPS DRIVE. FOR DRYWALL TO 16-18 GAUGE STEEL. 1000/BOX. PRICE/BOX. For attaching drywall to 16- to 18-gauge steel. Recommend 2 or 3 threads showing through steel. Positive advance with any screw size, 5/8" to 3"